Land Destroyer: The ICC and NGOs: Modern Day Manifestations of "The White Man's Burden"
It is an institutionalized tool - one of many - used by Western corporate-financier interests to coerce and control nations across the developing world. However, the ICC has - since its first case in 2003 - been used primarily against targets of Western interests - with a particular emphasis on Africa and Eastern Europe. Not a single Western government or individual has been prosecuted by the ICC despite having committed the worst war crimes of the 21st century. Unsurprisingly, the ICC's shortcomings stem from its little-discussed but very lopsided funding and the obvious resulting conflicts of interest. A look at the ICC's finances in the form of a chart further highlights the disparity in funding and reveals the ICC not as an "international" court, but a political tool of Western Europe and in particular - the European Union. When three of the "Five Eyes" nations are included and considering Japan's geopolitical subordination to Washington - the disparity is even more obvious. If these nations collectively wage war and commit war crimes together, why would they not also abuse the ICC's mandate to redirect the court's efforts away from them, and toward yet other targets of their own self-serving interests? The disparity, conflicts of interest, and demonstrable impropriety resulting from this lopsided funding has prompted nations to leave the ICC - with many more remaining, but demanding reform. Since the BBC's article was written, the Filipino government has also decided to withdraw from the ICC. Nations have left and rejoined it - not because of a perceived rectification of injustice - but because Western-backed political circles took power and predictably rejoined. Is it really fair to characterize the ICC as "international" when entire continents seek to withdraw from it and some of the largest, most populous nations on Earth (India and China) never joined in the first place? 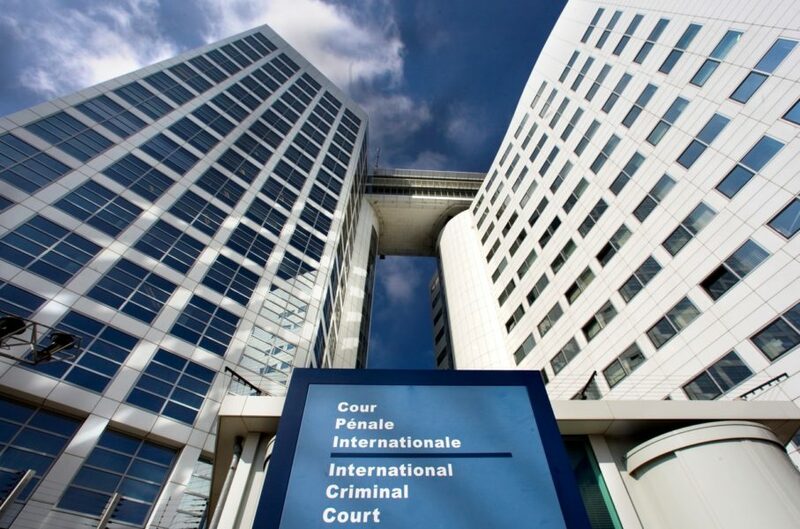 Is it fair to characterize the ICC as a "court" when it depends on funding from nations involved in the very war crimes it is supposedly tasked with investigating and prosecuting? Even with a perceived split between the US and EU - and the EU-dominated ICC seeking to investigate the US - it must be remembered that the EU itself aided and abetted not only the US' war in Afghanistan the ICC seeks to "investigate," it also participated in US war crimes in Iraq, Libya, Syria, and beyond. While it is tempting to believe the ICC now seeks to hold the US accountable - it is much more likely the US and the EU are attempting to rehabilitate the ICC's credibility in order to further exploit it against developing nations - and to do so together. While the US claims it opposes the ICC, having never ratified the statute putting the court into effect - it uses the ICC nonetheless. It does so in concert with the EU and through fronts - specifically through nongovernmental organizations (NGOs) funded by the US government via the National Endowment for Democracy (NED) and partner corporate foundations like George Soros' Open Society Foundation (OSF). To accomplish this, the US and Europe have been fomenting ethnic violence in Myanmar's Rakhine state where an essential leg of China's One Belt, One Road initiative (OBOR) passes through. US-funded NGOs have inserted themselves on both sides of the conflict and are attempting to overwrite Myanmar's sovereignty and the government's ability to deal with the growing crisis itself. One such NGO - US-based Fortify Rights - co-founded by Americans and funded by both the US NED and Soros' OSF (PDF) - has regularly worked with the ICC and UN to place pressure on Myanmar's government. 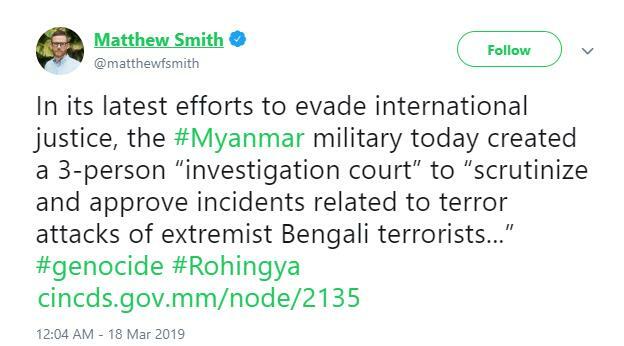 By "international justice," Smith is referring to US and European intervention and specifically through fronts like the ICC of which Myanmar is not even a signatory. A similar pattern is seen in Syria amid what is essentially a US-led proxy war. Despite the US' supposed aversion to the ICC - the ICC is used to undermine, threaten, and coerce the Syrian government - directly aiding and abetting the US war effort. As in Myanmar, the ICC's intervention in Syria is fed directly by NGOs - many of which are enthusiastically funded and supported by the US government - including Amnesty International and Human Rights Watch. 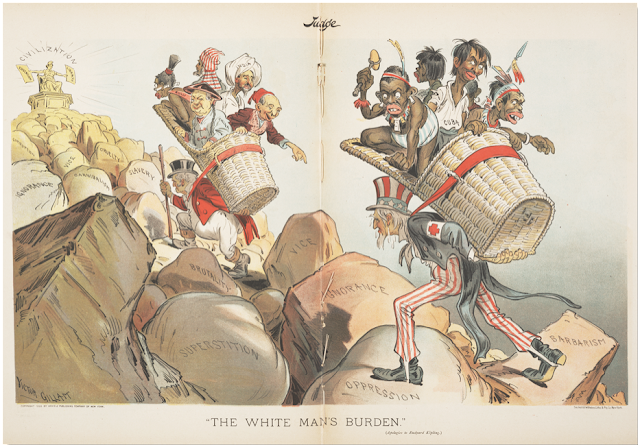 A Modern Day "White Man's Burden"
The poem, "The White Man's Burden: The United States and the Philippine Islands" written in 1899 by Rudyard Kipling, cited Western racial and cultural superiority to make a case for the US colonization of the Philippines. It proposed that Western hegemony was necessary to lift inferior races and civilizations from "savagery." Graphic and racist illustrations of the poem - while certain to shock most - might still resonant with modern-day Western NGO workers who honestly believe they are spreading superior aspects of "civilization" through their work and lifting up the "backward" and "uncivilized." The ICC and the NGOs that feed into it - including those funded and directed by the US - pose as modern-day, barely sanitized manifestations of "The White Man's Burden." Western NGOs assume Western values and institutions are superior and that it is their obligation to impose both upon the rest of the world. Through institutions like the ICC which are Western-directed and only "international" in the sense of the reach of their ambitions, nations targeted by the West are pressured from above, while Western-funded NGOs undermine targeted nations from below. In truth - the divide between West and East during Kipling's time was socioeconomic and technological, not racial. That divide has since been bridged and the notion of "racial superiority" fully extinguished by nations like China escaping out from under the West's shadow, and eclipsing the West. Fronts like the ICC are now endangered and struggle for legitimacy - charades like the recent US-ICC row will remain unconvincing as long as the fundamental flaws of the ICC itself remain unaddressed - and this includes its thinly disguised role in abetting Western - and more specifically - American hegemony.